Alba Bewick: In the land of the legless the one-legged woman is queen. ZOO is a film based upon the symmetry involved in nature. Two brothers (born as Siamese twins now separated) both lose their wives in a car crash caused by a pregnant swan flying into their car. It turns out that both women were expecting. The two brothers both mourn the passing of their wives and unborn children and become increasing obsessed with life and death, particularly the transition between the two states. 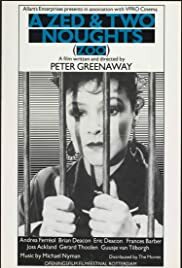 The Brothers happen to both work in a zoo as vets and use the zoos equipment in ever more bizarre experiments to observe the process of decay via time lapse photography (the results of which are shown frequently throughout the movie). The film progresses via a series of well thought out scenes, the visual content of which are more important than either the action or the plot. Greenway continues to explore the necessity of symmetry in nature and also its artistic merit. This however, is a subterfuge for the real meaning of the film, which is the realization of man that he lives alone in a Godless and empty universe where life and both its beginning and ending seem purposeless. A visual feast but a little pretentious.a bit like this message really.